Think of the heaviest living organism on Earth, and an image of a blue whale might come to mind. In fact, the honor goes to a single massive cluster of quaking aspen stems in Utah—but maybe not for long. 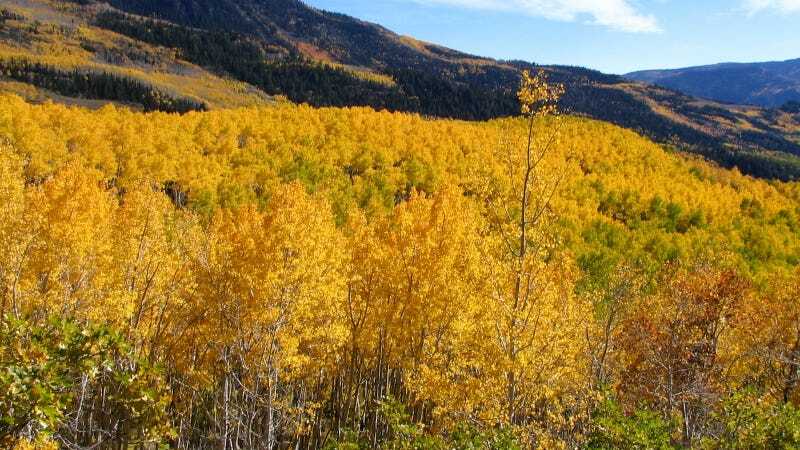 The Pando aspen grove, a 106-acre colony composed solely of quaking aspens, is a clone; it started out as a single male tree thousands of years ago. Quaking aspens reproduce using a process called suckering: A single tree sends out long, shallow roots. New stems, and new shoots, or “suckers,” then grow out of these roots. These suckers, under the right conditions, grow into what looks like entirely separate aspen trees, creating a vast, interconnected grove. But if new suckers don’t make it—if they’re eaten too quickly by animals, for instance—the future of the grove is put in jeopardy. That’s what’s happening to Pando, Paul Rogers, a professor at Utah State University’s Ecology Center and director of the Western Aspen Alliance, told Earther. Over the last 20 years, Rogers and other scientists started noticing that the vast Pando grove was sending out new shoots, but those shoots weren’t surviving. Scientists did clear-cutting in parts of the aspen grove in the late 80s—a method that is sometimes used by natural resource managers to stimulate growth in short-lived species such as aspen—but the trees never grew back. “To this day, there’s no forest at all there,” Rogers said of the clear-cut areas. For the most part, the herbivores Rogers is talking about are mule deer, though cattle herds in the region also play a role. The deer love the new aspen sprouts, which contain a lot of nutrients and are highly desirable in the late summer, when there aren’t a lot of other nutrient-dense plants left. They have few predators left in the area—humans hunted out most of the area’s bears, mountain lions, and wolves years ago—and Pando is located near a group of cabins, which means deer hunting in the area is limited. That means deer can hang around the Pando grove as long as they want eating as many aspen shoots as they want without fear of hunters. Rogers published a study earlier this year that found that, when trees were protected by fences, they successfully regenerated. In the unfenced parts of the grove, the aspen trees are elderly: aspens typically live between 50 and 150 years, so if they aren’t able to successfully regenerate, the grove can die out relatively quickly. Pando is the largest known aspen grove. At 6,600 tons, it’s also largest known single living organism by volume and dry weight—though in terms of area, a massive fungus has it beat. But Rogers noted that it’s not unlikely that there are groves as large or larger than Pando that haven’t yet been discovered by scientists. And as for Pando’s age, Rogers said it’s nearly impossible to say. There are estimates that the forebears of the current grove could have taken root as long as 80,000 years ago. Quaking aspens are common across Canada and in several northeastern and western states. They generally prefer cooler climates, so aspen populations in the southwestern U.S. grow only at high latitudes in order to escape the region’s hot summers. Colorado’s San Juan National Forest and Rocky Mountain National Park are also known for their aspens. Rogers calls aspen forests “ecosystem oases,” because they hold high levels of moisture and support a wide variety of plant, animal, and insect diversity. Aspen trees are ideal for cavity-nesting birds—such as woodpeckers and chickadees—because they have thin bark and tend to rot from the center, creating a hollow area where birds can nest. They also provide building material for beavers, which harvest aspens of all sizes. Without the Pando grove, these ecosystem services would disappear, Rogers said. Fences, like the ones Rogers tested in his experiment, are one potential management option for the grove, but Rogers said a fence surrounding the entire Pando site would cost around $60,000, would require constant monitoring, and would likely be unpopular with the public, as much of the grove right now is fully open to visitors. Still, something needs to be done. “We’re in a triage situation here—if we don’t do something, this whole system will collapse,” he said. Another option is culling some of the region’s deer. That’s also a tough sell, Jim Lamb, a biologist at the Utah Division of Wildlife Resources, told Earther. The deer that most often visit the Pando grove are does and their fawns in the summertime. Right now, hunters aren’t permitted to hunt deer in the summer, and convincing the public to allow culling does and fawns near the grove would be difficult, for obvious reasons. Lamb’s preferred option is fencing the grove. Right now, he said that his agency is working with the Forest Service as it develops management ideas for the grove, and he said the DWR would cooperate with any strategy the Forest Service comes up with. Rogers said that, overall, the plight of the Pando grove should make humans re-examine their relationship with the planet. The deer in the region didn’t become problems for the grove by themselves—they did so because humans interfered with their natural predators. Still, he’s hopeful the grove can be saved. The grove is getting public attention; the Forest Service is working to put up signs around the trees to educate the public; and Rogers and other researchers are continuing to gather data on the grove. “Overall, I feel like we’re building some momentum,” he said.